Wynnstay has two luxuriously refurbished flats that make a perfect base for touring Snowdonia and enjoying the many stunning walks and beautiful blue flag beaches. 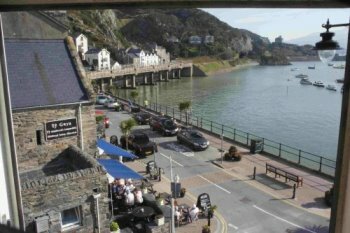 Centrally situated with all amenities close by, just a few paces to an array of restaurants, harbourside cafes and pubs, and all the interesting and varied shops in the High Street. Both flats offer a sea and harbour view. Furnished with comfortable designer furnishings and offering breath taking views from every window over the harbour at the front, and beach and Snowdonia beyond to the rear. People with restricted mobility may like to consider the lower flat due to the stairs.